Heat a dry frying pan and lightly toast the pine nuts. Tip out onto a plate. Heat the oil in the pan and fry the aubergine, stirring frequently for 5 minutes until it starts to colour. Add the onions and fry for a further 5 minutes. Stir in the celery and tomato sauce and cook gently for 5 more minutes. Meanwhile, drain the beans, reserving 100ml of the liquid. Blend the beans, liquid and seasoning in a processor until smooth. Scrape out into a small saucepan and heat gently for 1-2 minutes until hot. Stir the balsamic vinegar into the tomato sauce and add a dash of boiling water if it has lost its juiciness. 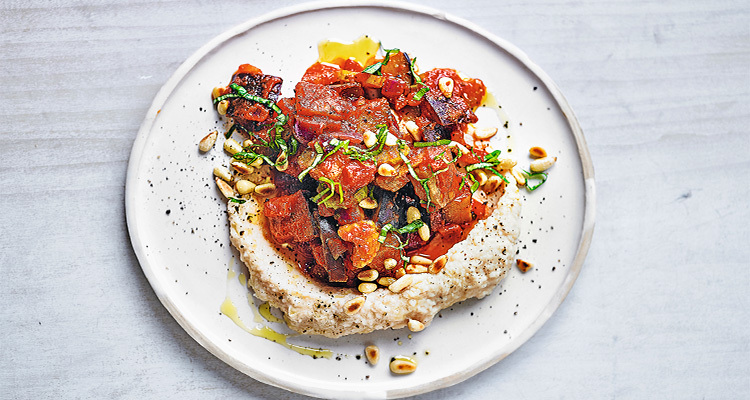 Spoon the bean purée onto serving plates, top with the stew and serve scattered with the pine nuts, basil or celery leaves.